A sample of the variety my bones have taken on recently. 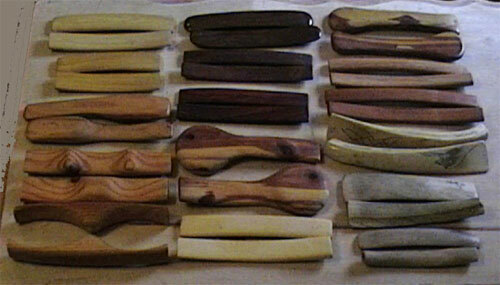 My favorites for shape are the Batleth bones at lower left; for sound the Lignum Vitae ones at top center. These bones are not for sale, but I can make some if you want a particular shape. I generally use wood that would have otherwise been thrown out or burned, so ask what I have in stock if you want a specific kind.